is about to trot out it's most outrageous act yet, according to The Sun newspaper on Friday 8th April. Who could possibly have dreamed up an act involving a guy riding an FMX bike underneath a dancing stallion? Still need a clue? Click here to read the article in full on Sun's website. Over 10 years ago renowned equine trainer Phoebe Murray established the “Stallions of Substance” in Grayshott, Surrey. From a long line of celebrated equine trainers Phoebe has concentrated on perfecting the outstanding performance of her Andalusian Stallions who have gained a reputation for their grace and unique style. Sisters Siobhan, Anne Marie, Charlette and Sarah Jane have inherited the innate training and horsemanship skills from their mother, now making the show a third generation display, and with Charlette’s son Kian nearly three, the fourth generation will be joining in a year or so, not forgetting the girl's younger brother Jack who is the motorbike stunt rider (horsepower NOT horse power). Their obvious talent has attracted significant media interest. The Murray sisters represent the future of the Stallions of Substance display team and have already been handpicked by the BBC to star in an international documentary on talented animal trainers. Phoebe aged eight with her older brother Jimmy (below left) on an Andalucian stallion called Pepe as part of their spanish display. 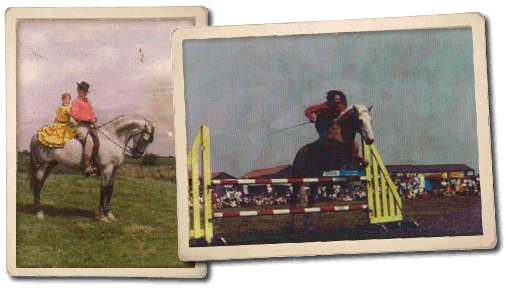 Phoebe aged sixteen riding Tony (above right) performing 21 jumps without saddle or bridle, Tony was also trained for liberty displays. Phoebe and Jimmy also appeared on kids TV show “Runaround” with Mike Reid as well as being the subject of a series of “Out of Town” episodes with renowned countryman Jack Hargreaves who was a personal friend of the family.